Discussion Thread for GPS III-2 mission. NET April 2019 on Delta IV from SLC-37 at CCAFS. DENVER, June 26, 2017 /PRNewswire/ -- In a specialized cleanroom designed to streamline satellite production, Lockheed Martin (NYSE: LMT) is in full production building GPS III – the world's most powerful GPS satellites. The company's second GPS III satellite is now assembled and preparing for environmental testing, and the third satellite is close behind, having just received its navigation payload. "From day one, GPS III has been a team effort and our successes would not have been possible without a strong Air Force partnership. GPS III will ensure the U.S. maintains the gold standard for positioning, navigation and timing," said Stewart. "We look forward to bringing GPS III's new capabilities to our warfighters and beginning to launch these satellites in 2018." Would you also change the SpaceX launches to be after that? I don't know, but it's quite possible (likely?) GPS will launch on F9 before Delta IV. SV02 completed thermal vacuum testing in December 2017 and is "expected to be declared 'Available for Launch' this summer." DENVER, Aug. 21, 2018 /PRNewswire/ -- As the first Lockheed Martin-built (NYSE: LMT) GPS III satellite prepares to ship to the launch pad, the U.S. Air Force has declared that the second GPS III satellite is complete, fully tested and ready to launch. The Air Force's "Available for Launch" declaration is the final acceptance of Lockheed Martin's second GPS III Space Vehicle (GPS III SV02) – declaring it technically sound and ready to launch. GPS III SV02 will bring new capabilities to U.S. and allied military forces, and a new civil signal that will improve future connectivity worldwide for commercial and civilian users. GPS III SV02 now awaits official call up for launch in Lockheed Martin's GPS III Processing Facility clean room in Denver. In June, the Air Force officially called up its first GPS III satellite for launch. "The first GPS III satellite, GPS III SV01, was declared 'Available for Launch' in September 2017. It is now being prepared for shipment to Cape Canaveral, Florida for a launch before the end of the year," said Johnathon Caldwell, Lockheed Martin's program manager for Navigation Systems. "With two GPS III satellites now ready for launch, and the third GPS III expected to be ready by early next year, we're building strong momentum. These satellites will soon begin modernizing the current GPS constellation with new capabilities and more advanced technology." GPS III will be the most powerful GPS satellite ever on orbit. GPS III will have three times better accuracy and up to eight times improved anti-jamming capabilities. GPS III's new L1C civil signal also will make it the first GPS satellite to be interoperable with other international global navigation satellite systems. Lockheed Martin is now in full production on ten GPS III satellites at its GPS III Processing Facility near Denver. In June, GPS III SV03 completed Thermal Vacuum testing, strenuous environmental trials simulating operations in the harshest space environments. In May, the antenna deck was added to GPS III SV04, fully integrating it into a complete satellite ready to begin environmental testing. Right behind GPS III SV04 on the production line, the fifth, sixth and seventh GPS III satellites are in component build-up. The fifth satellite already has its navigation payload and is expected to be fully assembled later this summer. To date, more than 90 percent of parts and materials for all 10 satellites under contract have been received. In April, the company submitted a proposal to the government to build up to 22 additional GPS III Follow On (GPS IIIF) satellites which would bring even further enhanced capabilities to the GPS constellation's more than four billion users. Shotwell confirmed after the panel that the Falcon 9/Telstar 18 Vantage launch slipped a day to Sunday night (EDT), didn’t specify a reason. Now targeting September 9 launch of Telstar 18 VANTAGE from Pad 40 in Florida. Rocket and payload are healthy; additional time will be used to complete pre-flight checkouts. Delta IV-Heavy/NROL-71 delayed from September 26 to December 3. Delta IV-Medium/WGS-10 launches on January 23, 2019. Falcon 9/Dragon CRS-17 delayed from NET February 1 to February 17, 2019. Minotaur I/NROL-111 delayed from December 2018 to 2nd quarter 2019. Delta IV-Medium/GPS III-2 launches on April 4, 2019. Falcon 9/GPS III-3 delayed from August 2019 to October 2019. This is the last Delta IV-Medium launch. More particularly, it's the Delta IV-M variety with a 4-meter diameter upper stage and 2 solid rocket boosters. Will the same be true for the DCSS on this launch? Yes, there is a de-orbit burn for this mission. Ah, this is where GPS III -2 is. I was confused because SpaceX has 1, 3 and 4. From the post with Starliner adapter unloading pictures (https://forum.nasaspaceflight.com/index.php?topic=43958.msg1875342#msg1875342), it looks like the first stage for WGS-10 was also being delivered on the Mariner. I wonder if the DCSS was also aboard? The common booster core first stage and the Delta Cryogenic Second Stage arrived in July, 2018 at Cape Canaveral Air Force Station from our factory in Decatur, Alabama, sailing to Florida aboard the Mariner cargo vessel. Delivery was earlier than first appeared! By process of elimination, this November 2018 delivery could be the CBC of this last Delta-IV Medium! If not both the CBC and DCSS. And the final launch of a Delta 4 medium version rocket will loft the second next-generation GPS III series satellite on July 25. EDIT 3/16 UTC: This is it--one more Delta Medium launch to go. 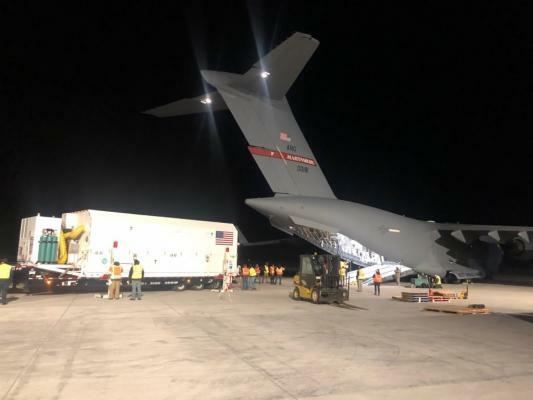 CAPE CANAVERAL, Florida, March 26, 2019 – The U.S. Air Force’s second new GPS III satellite, bringing higher-power, more accurate and harder-to-jam signals to the GPS constellation, has arrived in Florida for launch. On March 18, Lockheed Martin (NYSE: LMT) shipped the Air Force’s second GPS III space vehicle (GPS III SV02) to Cape Canaveral for an expected July launch. 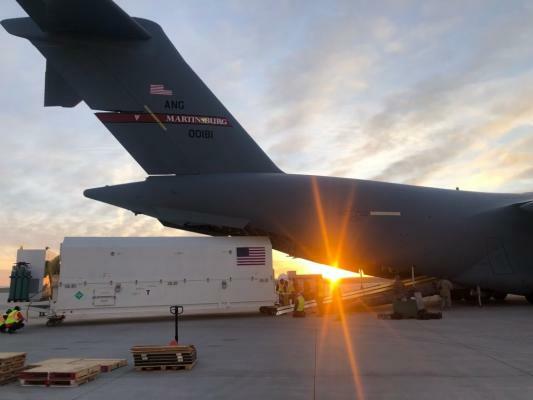 Designed and built at Lockheed Martin’s GPS III Processing Facility near Denver, the satellite traveled from Buckley Air Force Base, Colorado, to the Cape on a massive Air Force C-17 aircraft. The Air Force nicknamed the GPS III SV02 “Magellan” after Portuguese explorer Ferdinand Magellan. GPS III is the most powerful and resilient GPS satellite ever put on orbit. Developed with an entirely new design, for U.S. and allied forces, it will have three times greater accuracy and up to eight times improved anti-jamming capabilities over the previous GPS II satellite design block, which makes up today’s GPS constellation. The Air Force began modernizing the GPS constellation with new technology and capabilities with the December 23, 2018 launch of its first GPS III satellite. GPS III SV01 is now receiving and responding to commands from Lockheed Martin’s Launch and Checkout Center at the company’s Denver facility. GPS III SV02 is the second of ten new GPS III satellites under contract and in full production at Lockheed Martin. GPS III SV03-08 are now in various stages of assembly and test. The Air Force declared the second GPS III “Available for Launch” in August and, in November, called GPS III SV02 up for its 2019 launch. In September 2018, the Air Force selected Lockheed Martin for the GPS III Follow On (GPS IIIF) program, an estimated $7.2 billion opportunity to build up to 22 additional GPS IIIF satellites with additional capabilities. GPS IIIF builds off Lockheed Martin’s existing modular GPS III, which was designed to evolve with new technology and changing mission needs. On September 26, the Air Force awarded Lockheed Martin a $1.4 billion contract for support to start up the program and to contract the 11th and 12th GPS III satellite. Once declared operational, GPS III SV01 and SV02 are expected to take their place in today’s 31 satellite strong GPS constellation, which provides positioning, navigation and timing services to more than four billion civil, commercial and military users.